Meridian students won top awards at the recent SkillsUSA National Leadership and Skills Contest in Louisville, Kentucky. Guthrie student Baylor Bukofzer won second place in the post-secondary 3D Visualization & Animation contest. This contest allows students to step into a real-world 3-D production environment where creative output must be accomplished within specific timeframes, resources and design constraints. Contestants are evaluated on their technical knowledge, production skills and creative abilities – including visual development and storyboarding. Stillwater students Joseph Popplewell and Kaleb Stephenson won fifth in the secondary division of this contest. Addison Frieling, Glencoe, and Stillwater students Christopher Brubaker, Spencer Deines and Guy Major won third place in the Teamworks contest. This event evaluates the work of four students and their ability to build a construction project over three days. Teams are judged on their ability to work together as a team, their understanding of project elements based on a detailed blueprint and special instructions and their ability to work together using carpentry, electrical, plumbing and masonry skills. Students who won first place at the state level earlier this year qualified to compete against other first-place winners from across the nation. Dylan Cates, Pawnee; Jacob Jackson, Perkins; Samuel Spence, Morrison; and Stillwater students, Katie Carlisle, Adam Foulke, Weston Brawley and Matthew Miller also competed at the national contest. Full-time adult and high school students attending Meridian can join one of several student organizations related to their field of study: Business Professionals of America; Family, Career and Community Leaders of America; HOSA – Future Health Professionals; or SkillsUSA. 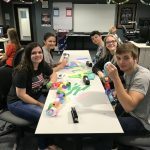 These organizations provide students an opportunity to gain leadership skills and ultimately compete against other technology center students from across the state and nation. During each round of competition, students develop and demonstrate skills that include public speaking, presenting, working together as a team, interviewing and technical skills related to their area of study.